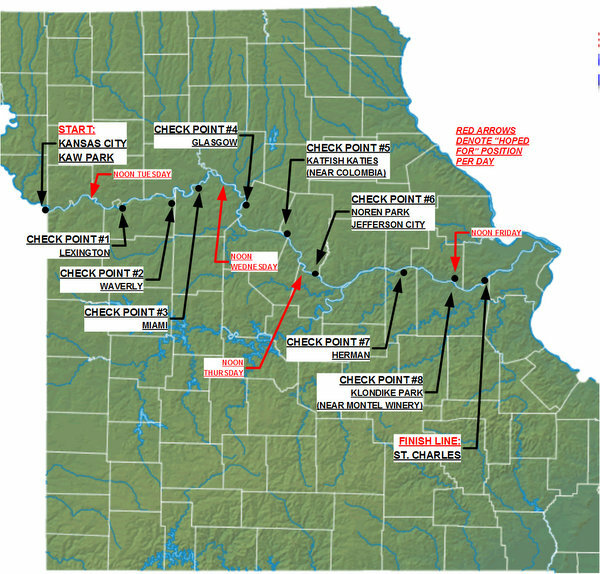 The MR340 is a “human powered” endurance boat race across Missouri with an 88 hour time limit and 8 mandatory check points. Sleep is optional and at whatever location the exhausted participants choose to rest. 88 hours of mud and heat. 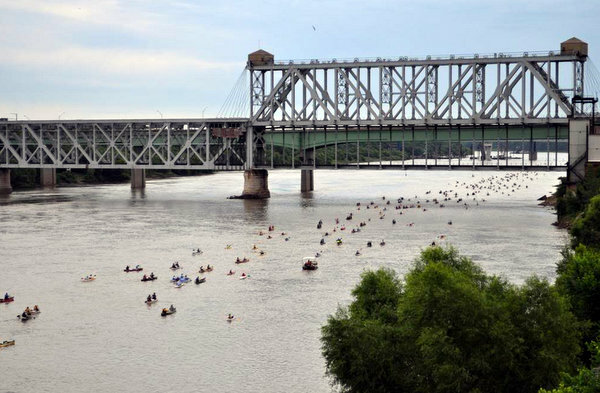 Video drones whirled over the congested launch points and hovered over the Kansas River filming both anxious racers undertaking last minute adjustments and the cheerful support crews or worried family members gathered under the tall cottonwood trees of Kaw Point. The rising sun promised another sweltering Midwest summer day, but the growing light to the east also beckoned toward the finish point, 340 miles downstream. Before the start of our third MR340--all smiles because the heat had not yet arrived for a scorcher summer day. 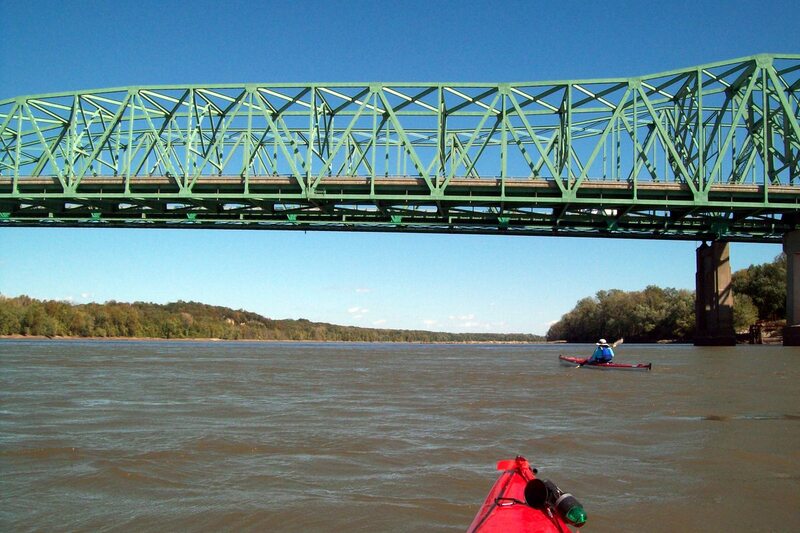 At 7am the cannon sounded and the paddlers rushed towards the turbid confluence of the Kansas and Missouri Rivers. 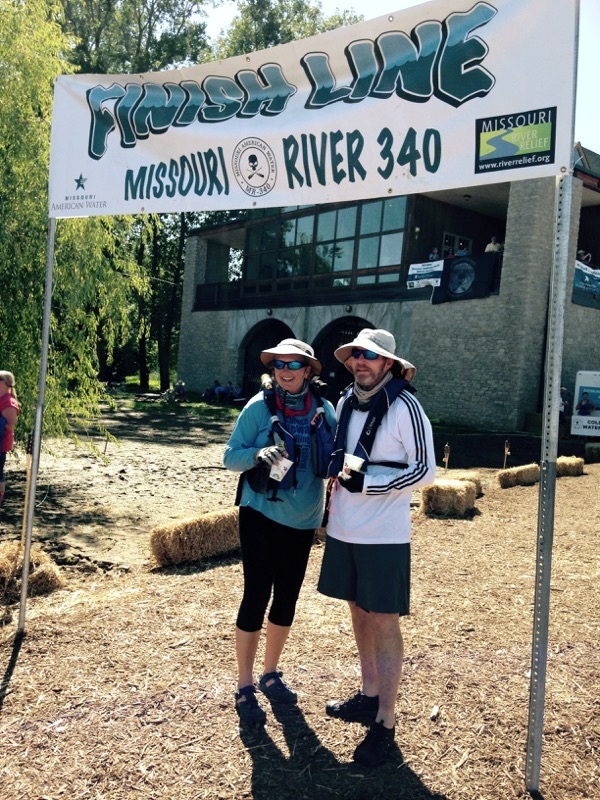 Bunny and I, both veterans of the MR340 pushed our kayaks to the side to let the multitude of excited racers bump and bang their way into the muddy Missouri River. Knowing from past experience, it was best to make space for both the gifted racers in their sleek carbon fiber racing boats and the overly eager first timer racers-many of them fervently paddling dented aluminum canoes. In only a few moments the muddy river had grabbed the log jam of boaters and pushed them downstream. 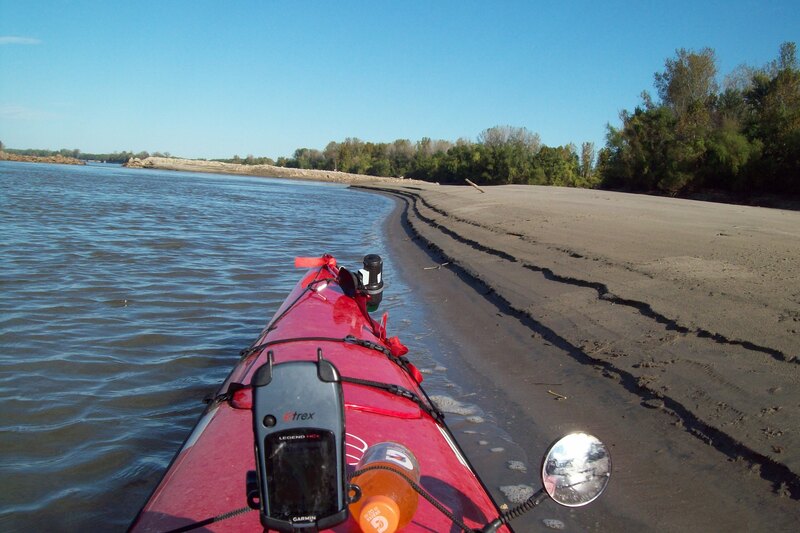 Giving a final wave to the buzzing drones we crossed the bumpy passage out of the slack Kansas River and into the faster flowing Missouri River. Like the other racers we were not immune to the race excitement that was prodding us to paddle faster; however from previous MR340 races we knew the challenge was to actually slow down, calm the race jitters and use our practiced “long distance paddle stroke” that would conserve energy to push us down river all day and well into the night. 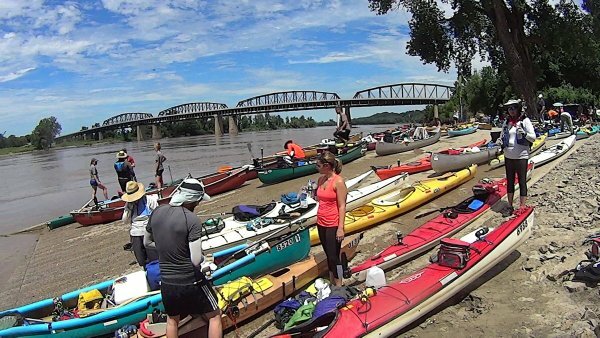 After all there was not exactly a requirement to rush when there are 340 miles to paddle and the afternoon temperature was forecast at 98 degrees. Our goal was to set up our first overnight camp at check point #3, near the town of Miami 105 miles downriver. The crowded race start in Kansas City. Only for a few miles and the racers spread out. 105 weary miles later – the last 30 miles paddled under the full moon we pulled our boats onto the muddy checkpoint #3, to pitch our tent amongst 50 or so other campers; hopeful to catch a few hours of sleep and get back on the river by 4am. Lightning flashes to the north caused concern however there was no cell phone reception to check the NOAA satellite. Around 2 am an ominous wind began to rustle the cottonwood tree branches, lightning flashes grew brighter and thunder sounded moving ever closer. By 3 am the storm swept over the campsite bringing cold rain and blustery winds that snapped tree limbs to crash amongst the tents. I got up to check on the kayaks only to witness tired racers scrambling to install rain covers on their tents. Above the boat ramp I verified the safety of our boats. Even then paddlers with flashlights were just arriving at the check point- vastly relieved to be off the river and I helped three people struggle out of a water filled canoe. 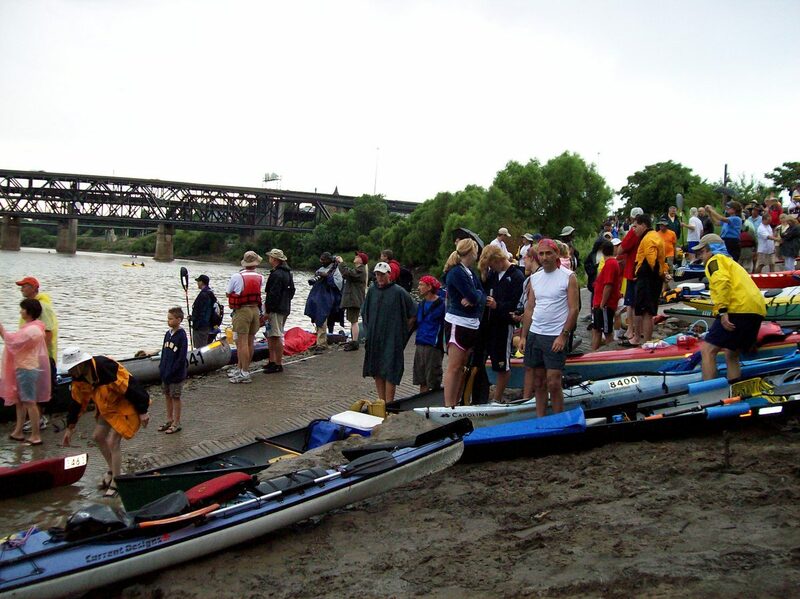 Those of us at Miami were the lucky few -because hundreds of racers up and down river of the check point were caught in gusting winds that capsized boats and lightning forced other paddlers off of the river to scramble up the muddy banks in pitch darkness. We dragged the canoe up the wet ramp, the wind was gusting so hard I could not even slip on the poncho retrieved from my kayak. “Well this is an adventure” I thought shivering from the cold rain and searching the darkness for a funnel cloud during the windy walk back to the tent. At our campsite I discovered a branch had partially collapsed the tent, our rain fly blown off and Bunny sheltering in the passenger seat of a nearby pickup truck. I crawled into our wet tent and unwrapped a mylar “space” thermal blanket. Curling into the foil blanket, my shivering stopped and I slept until a grey dawn. Surprised at how well I had slept even with my bare feet hanging in the rain. At daylight I found my sandals floating beneath my cot. The campsite was inundated with three inches of water. Mud? No problem, just a late start to another day of mud. Breaking camp we noticed there were many boats already loaded on vehicles, -racers who had enough of the MR340 experience and were quitting. At the boat ramp we found at least a dozen racers passed out on the concrete ramp, no tents, no bug repellent, just fatigued. 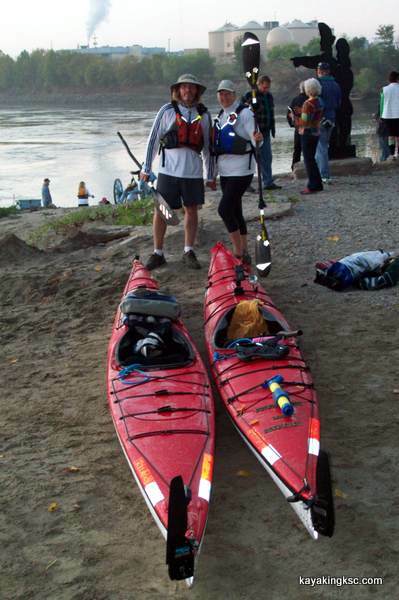 We lifted our kayaks over sleeping bodies and pushed into the river for Day 2 of the race. For the next 50 miles we observed upended and broken trees and exchanged exciting stories with fellow racers about surviving “The Storm.” Bunny and I ever more thankful that we were not on the water when the storm hit and unlike many others we were actually able sleep a few hours. The plan for day two was to complete another 100+ miles. On the second afternoon we passed the bridge that marked the “Halfway point” This was the same bridge, where during a previous MR340 race we had taken shelter from a fierce hail storm. The farmland next to the bridge under which we had huddled belonged to the grandfather of a former Kennedy Space Center employee. We do indeed live in a small world. The third afternoon we reached check point #8 at the town of Herman. There was still at least 4 hours of daylight remaining and an easy 80 miles to the finish line. However we made the decision to stop and spend a well-deserved evening relaxing on a rise above the river, enjoying both the spectacular sunset and a brilliant full moon that changed the muddy river to silver in the moonlight. Nevertheless, because we were actually in a race, it was bittersweet to observe the boats check in and out of Herman making their night journey towards the finish line. 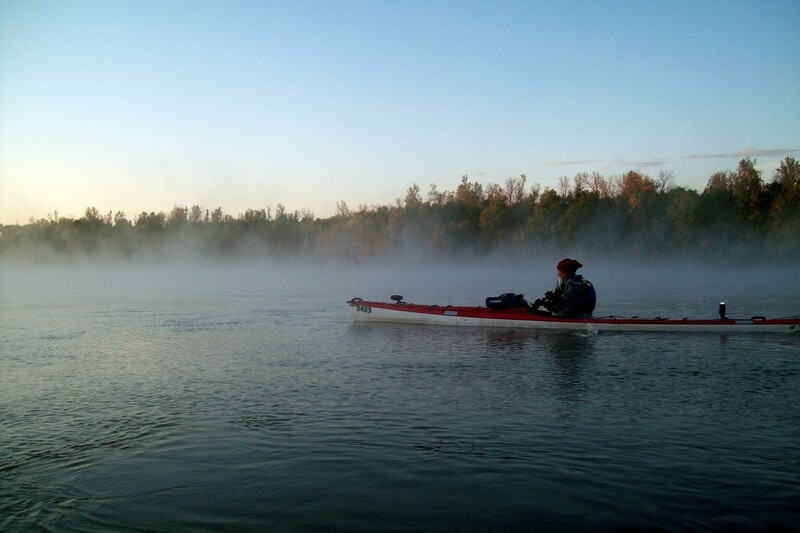 The next morning- and final day of the race, we were again on the river before sunrise however after paddling only a couple of miles in the pre-dawn darkness, we watched with alarm as a huge fog bank blotted out the stars filling the river valley from bluff to bluff. For the next eleven miles we paddled cautiously nearly blind through the damp fog. The sun rose to the east as a dim pale light illuminating cliffs and wispy tendrils of fog on the swirling river. At times our visibility was reduced to less than ten feet. Slipping through the extensive fog bank we passed many of the paddlers that we had seen continue on from Herman the evening before. Many had been stranded in the fog nearly all night, attempting to sleep in their boats waiting for an interruption in the whiteness. The Bridges of St. Charles Missouri signaled were close to the finish line. In the afternoon approaching the finish line near the city of St. Charles we counted off the bridges that marked the end of the race. The five bridges upstream of the finish line were both a welcome sight and at the same time somehow disappointing- signifying the end to our four day adventure. Rounding the last river bend in sight of the finish line we watched incredulously as a canoe in front of us continued on past the packed shore--the exhausted racers in the canoe not even realizing they had completed the 340 mile race! 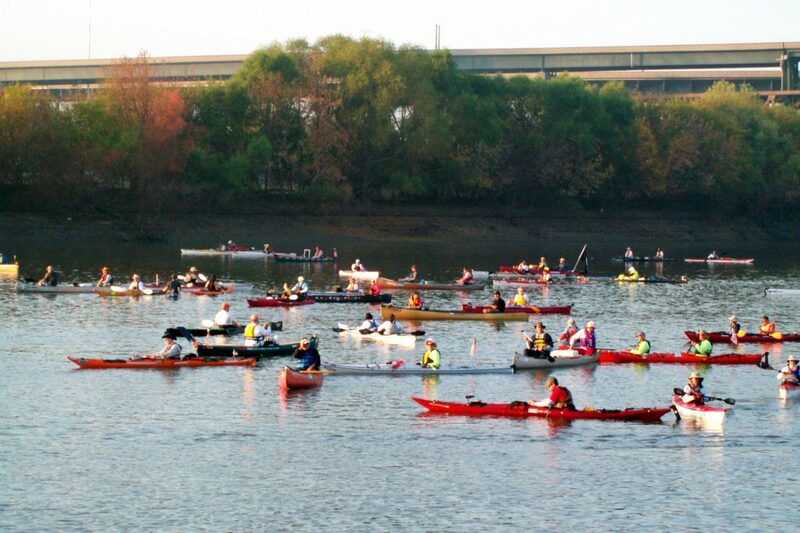 The crowd on shore began to yell and we watched as the canoe laboriously turned around and began the paddle upstream. When we reached the flag marking the finish and were helped out of our kayaks, receiving water, congratulations and pats to the back. I asked Bunny if she would be willing to enter the 2016 MR340? I made this map of the MR340 race. List the checkpoints and our goal of for each day. This is the "easy" race pace in which we sleep for six hours a night. Why enter the grueling MR340 race with 600 other hopeful finishers?